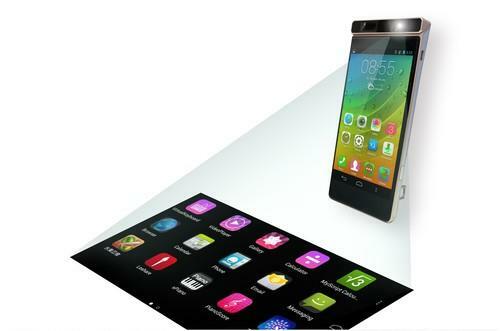 Lenovo's concept for a new smartphone with a projector on top. A Lenovo concept smartphone that's fitted with a laser projector module can display content on a hard surface, like a table or wall, where users will be able to interact with the projected images. On Thursday, Lenovo showed off "Smart Cast," which can also read the gestures of users interacting with the projected images: in one demo, a user was able to play a song on the image of a piano keyboard projected onto a table. As Google's annual I/O developer conference kicks off on Thursday, the New York Times reports that one of the areas rumored to be overhauled is mobile payments, where the search giant's Google Wallet has underwhelmed to date. The Times says that it will introduce a service called Android Pay for making credit card payments from inside mobile apps, while Google Wallet will be recast as a peer-to-peer payments app for sending money to your friends. It may be impossible to find a mobile phone user who won't welcome the news that the U.S. Federal Communications Commission wants to give them more tools to block unwanted text messages and phone calls. A new proposal would close loopholes in the Telephone Consumer Protection Act of 1991 that have allowed some marketers, bill collectors and other businesses to send unwanted text messages or make unwanted robocalls. While Uber and Lyft fight it out in the cutthroat ride-hailing app business, Sidecar is busy carving out a unique niche: After adding medical marijuana deliveries to its portfolio of services offered in San Francisco earlier this month, it's now in talks with potential partners to deliver alcohol and pharmaceutical drugs to its users. CEO Sunil Paul said it aims to have those items on board by the end of the year. A software development kit for writing native Apple Watch apps is on the near-term horizon, re/code reports. At the moment, developers have been limited to customizing iPhone apps so that they can take advantage of some Watch functions. With the new SDK, developers can write games to run on the watch, and also access its sensors. Wearables in the fitness space may be an endangered species as multi-function smartwatches take off, but two of the leaders in that market are taking their intense rivalry to court in California. In a complaint filed Wednesday, Jawbone is accusing rival Fitbit of "systematically plundering" its employees, trade secrets and intellectual property. A case brought by German media groups upset that ad-blocking software cuts into their revenue streams has gone against the plaintiffs, the Financial Times reports. The Munich district court ruled Wednesday that not only is the software legal, so is offering advertisers the paid option to get on a "whitelist" of ads that aren't blocked. The media companies had claimed that Adblock Plus violates laws on competition and copyright, among others. Avago Technologies is in advanced talks to acquire Broadcom in a potential deal that could mark the latest consolidation in the global semiconductor industry, according to a report in the Wall Street Journal. Broadcom makes chips for a wide range of communications products, including wired and wireless networks, connected home and car equipment and the Internet of Things. Avago's silicon goes into industrial and enterprise storage gear as well as wireline and wireless networks. Researchers have developed semiconductor chips that are almost entirely made out of wood-derived material. Aside from being biodegradable, the chips could be produced for only a fraction of the cost of conventional semiconductors, according to the researchers from the University of Wisconsin-Madison and the U.S. Department of Agriculture. For the substrate of the chip, they used cellulose nanofibril (CNF), a flexible, transparent and sturdy material with suitable electrical properties. The International Drone Expo in Japan featured a number of unusual UAVs, like glider-shaped machines that can take off vertically, drones with flashing lights and palm-sized flyers. A security researcher explains why proposed export controls on cybersecurity tools could make the world more dangerous and send people like him to jail.